TBogg’s phony excuse for the deleted Flight 93 document — 1389 Blog - Counterjihad! TBogg’s phony excuse for the deleted Flight 93 document. Fortunately through the miracle of intertubes nerdiness the Lost Commentinent has been rediscovered and you can go read them here. TBogg insinuates that the Holoscan snafu is the reason that the restored comment thread is missing the Jaques comment, but he does not actually say it, and for good reason. The Jaques deletion had nothing to do with any comment system switchover. A commentator at Alec’s Error Theory blog looked up TBogg’s site on the Wayback Machine. Turns out that Wayback was taking snapshots of Tbogg’s comment threads every week. Only Blogspot comments show up on Wayback, but that is all that is needed to tell the tale. Throughout the period in question (spring and summer of 2006) all of TBogg’s Blogspot comment threads are stable except for the “infamous” one, which actually exhibits quite a bit of activity. Not only did TBogg hand delete Jaques comment, but he was apparently torn about it, changing his mind a number of times over a period of weeks. It is not known exactly when Kevin Jaques was asked by the Memorial Project to write an assessment of Alec Rawls’s warnings about Islamic and terrorist memorializing features in the Crescent of Embrace design. Most likely he wrote it in late March of 2006, just before he posted it at the end of TBogg’s January 6, 2006 comment thread. The Park Service has released excerpts from Jaques’ comment, proving that the TBogg comment comes from Jaques, but it has never released the revealing parts, like where Jaques says not to worry because one has ever seen a mihrab this big before. TBogg is THE source for the full text of Jaques’ analysis, with its blatant excuse-making for the giant mihrab. Having this analysis publicly available was a problem, both for Jaques and for the Park Service. Since TBogg had no way of knowing that on his own, it seems that somebody must have contacted him, because in the July 21, 2006 snapshot of Tbogg’s Lunacy Abounds comment thread, the Jaques comment is missing from the end. Blogger allows blog administrators to hide and show comment threads, and it allows them to delete individual comments. Blogger also allows people who comment non-anonymously to delete their own comments. Jaques left his comment anonymously, so only a blog administrator could have deleted his comment. Unless TBogg got hacked, that would have been TBogg. If “all of the previous comment threads were lost,” that was a separate incident. The archival record shows that a blog administrator went in and turned off the Lunacy Abounds comment thread by hand. Again, unless TBogg got hacked (or the Wayback Machine is wacked), that was TBogg. Of course TBogg did not say anything about getting hacked. He insinuated that Haloscan is the culprit. Nope. Haloscan is innocent. Does TBogg want to try pointing the finger anywhere else? On August 28, 2006, the “infamous comment thread” reappears, again without the Jaques comment. Wayback doesn’t have TBogg snapshots for 2007, but for most of this year the comment thread was again turned off (the Haloscan snafu? ), until sometime recently TBogg himself retrieved the comment thread (without the Jaques comment) from the wayback machine and linked it to his original Lunacy Abounds post. Not quite Hamlet. TBogg consistently wants the Jaques comment “not to be.” He just can’t decide how he wants it not to be. So, yes. I have been busted. I’ve been getting more payoffs than Bill Bennett with a roll of nickels at Circus Circus. Between George Soros and Osama bin Laden I’ve received so many Miatas, that some of them are still sitting around in the blister packs. At least he makes it amusing, but the joke is on the Bogglings. TBogg actually meant the “I have been busted” part. Will TBogg’s legions of vitriolic followers take this Clintonian lie kneeling down? TBogg will have to suffer some embarrassment for duping his readers, but so what? The man embarrasses himself every day. The important thing is that he is in a position to actually be of help in exposing the cover up of Islamic and terrorist memorializing features in the Flight 93 memorial. Who contacted him? What did they say? Did he knuckle to a plea from Jaques alone, or was he actually contacted by the government? TBogg could well have been duped himself. Maybe someone at the Park Service told him that this was an internal government document that was not supposed to be available to the public and asked if he could please remove it. Now that he knows a) that the Park Service is accused of perpetrating a cover up, and b) how the document that he himself covered up contains clear examples of dishonest excuse making, TBogg is in the same position as his army of Bogglings. He knows that he has been used. 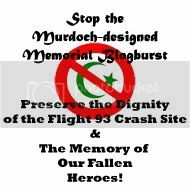 Can’t we all just be against planting a terrorist memorial mosque on the Flight 93 crash site? There is no reason for a left-right divide over the Flight 93 Memorial. It isn’t the critics of the crescent design that politicized the issue, but the defenders of the crescent, starting with newspapers like the Pittsburgh Post Gazette that knew about the Mecca orientation of the giant crescent back in 2005 and decided not to publish it. They were too busy using their editorial page to slam critics of the crescent as right wing bigots. Inconvenient facts could not be allowed to interfere with their chosen story line. Then there are people like TBogg who politicize everything. Instead of checking the facts, he starts with his presumptions about which side he should be on, then looks for smarmy ways to characterize the opposition. That is not a rational thought process, but he can more than redeem himself if he will just stop deceiving everybody and start helping to expose the facts. Is the giant crescent is really oriented almost exactly on Mecca?Is the 9/11 date really inscribed on a separate section of Memorial Wall that is centered on the bisector of the giant crescent, placing it in the exact position of the star on an Islamic crescent and star flag? Is it true that every particle of the original Crescent of Embrace design remains completely intact in the so-called redesign? This is what the blogosphere OUGHT to be good for. If TBogg is too busy to check the facts, why not put his minions to work? For more on who TBogg has been covering up for, see last week’s post on Dr. Jaques 2001 article, where he argued that we should formulate our response to the 9/11 attacks in accordance with sharia law. How did this advocate for Islamic supremacism become the Memorial Project’s sole consultant on the warnings of Islamic symbolism in the crescent design during a crucial period when the Project’s dismissive posture was set in stone? If TBogg would tell us what he knows, it might help answer that question, or pose others equally important. No more deception. Just tell the…truth.